I love eating these wonton cups with a drizzle of chili oil on top for extra heat. Double the recipe if you are making appetizers for a large group of people. You can also make the wonton cups with circular dumpling wrappers, but they’ll look more like a shallow bowl. If you are pressed for time, you can replace the carrots and shredded cabbage with 3 1/2 cups of packaged coleslaw mix. Preheat the oven to 350ºF. Position the oven racks to the top third and lower third positions. Spray two 12-cup muffin pans with cooking spray. Line each of the cups with a wonton skin. Make sure to press the skin against the bottom and edges of the pan to ensure that you get a nice, open wonton cup. Lightly spray the wonton skins with cooking spray. Place the muffin pans in the oven and bake for about 8 to 9 minutes, until the tops are golden brown. Take the wonton cups out the oven, and let them cool on a rack. Drain the package of tofu and wrap it with a muslin cloth or paper towels. Place the wrapped tofu onto a plate. Add a stack of plates on top of the tofu, and let the tofu sit for about 20 to 30 minutes. Unwrap the tofu, and cut it into 1/2 to 3/4-inch slices. Drizzle the soy sauce over a non-stick skillet. Take each slice of tofu and cover it with the soy sauce. Drizzle the canola oil into the pan, and turn the heat to medium-high. Pan fry the tofu for about 3 to 4 minutes and then flip them over to the other side. Let it cook for another 3 minutes. Turn off the heat and transfer the tofu to a plate. Once cooled, chop each slice of tofu into 1/2-inch cubes. 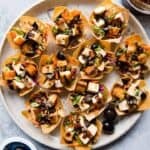 In a bowl, toss together the tofu cubes, chopped California Black Ripe Olives, sliced scallions, sweet chili sauce, toasted sesame seeds, and salt. Set it aside. In another bowl, toss together the julienned carrots, shredded cabbage and red cabbage, rice vinegar, sweet chili sauce, sesame oil, and salt. Assemble the wonton cups. Add a bit of the salad to the bottom of each cup. Spoon the tofu and olive topping over the salad. Drizzle each wonton cup with chili oil, if desired. Serve the wonton cups immediately. You can make the wonton cups up to 2 days ahead. Store the baked wonton cups in an airtight container. *I quartered each olive and then sliced each quarter in half or into thirds, depending on the size of the olive. **I sliced the carrot into 1 1/2-inch chunks before I julienned the carrot.